While a huge number of kits of tanks, aircraft and others contain no figures at all, sometimes a manufacturer will bring a little life to their creation by including at least some sort of crew. Many are no more than a single pilot or driver, but occasionally we are treated to something a bit extra such as soldiers or mechanics to display in, on or around the main kit. Over the years Airfix have been one of the best in this regard, so this article takes a look at those extra figures that can be obtained so long as you don't mind buying the whole package just for a particular figure. Clearly the skills required to fashion an accurate and enjoyable kit of some machine are not the same as those required to model a credible human being, and perhaps that is why sometimes a good kit has really bad figures. Below are a couple of examples, which are the crew from the Airfix R.E.8 aircraft kit. You don't need a review to see how poor these are, and in fact they are even worse as they are particularly thin too. This is probably to ensure that they fit comfortably in the available cockpit, but when seen by themselves they look really bad. However even if they had been great sculpts they would have been good for little else but placing in the cockpit of a Great War aircraft, so we will not be visiting any of these odd singles or pairs of figures with only one real application. Luckily some other Airfix kits have delivered much better and more numerous figures, so this article looks at those kits that went further than just a solitary pilot or a rather static driver, and celebrates the days when Airfix put a bit more imagination and interest into their products. Below is a list of all the kits with figures we think worthy of comment. 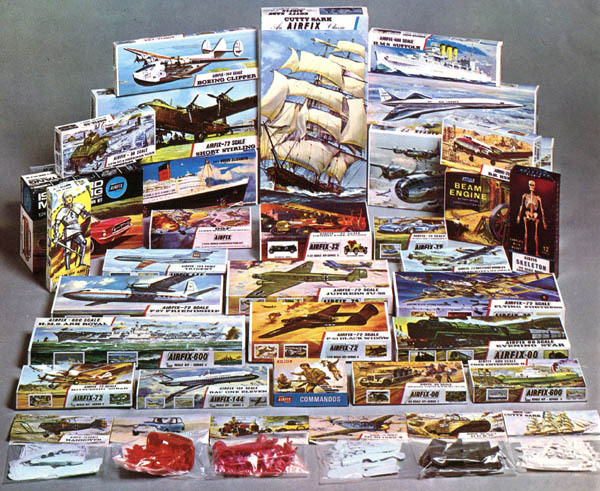 For each we will show the figures in our usual style, along with the box artwork and examples of the kit as presented in any of the Airfix catalogues over the years. Pick one that is of interest, or pick the first to browse through them all.